The temperature warms up 5 degrees and I'm all like "put away the parka, get out the spring coats"! Well, this weekend was so not the weekend to be testing out that idea! It's still ridiculously cold and I think the red nose and abundance of cold weather accessories proves that point. In all honesty, I am sick of the winter coats and black on black ensembles! I am constantly looking for ways to inject some colour and fun patterns into my outfits, and pink sweaters and leopard print always seems like an appropriate choice. Do you play with colour in the winter, or are you all about whatever is warmest? This year I realized I have an obscene amount of pink sweaters and they are getting all the wear! The colour makes me most happiest so why not wear it as much as I can! This pink sweater (which you can barely see due to the massive faux moment- haha) I scored at Loft and it's the coziest thing, but can totally be dressed up with a pair of booties and overcoat. I've been loving pairing pink on pink (just look at my Instagram) to break out of the wardrobe rut, but also love pairing it with prints, even in winter. It's fun and can be a real mood changer! 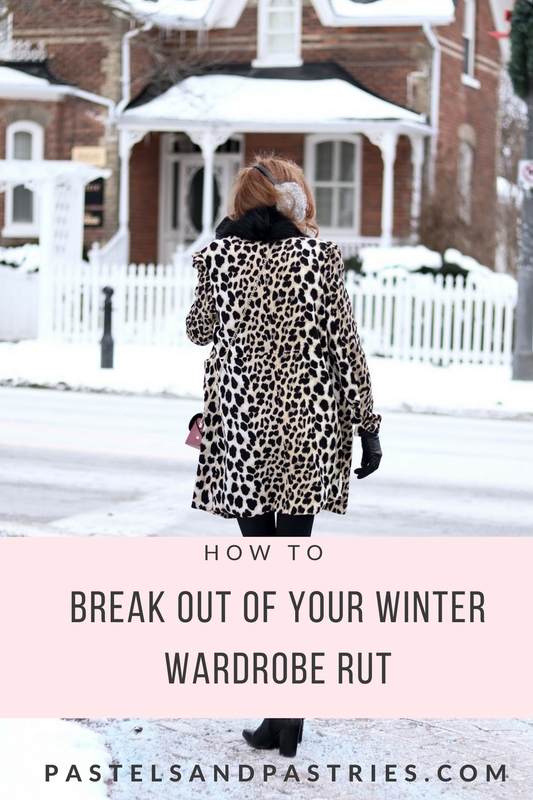 If you're wondering how to break out of the wardrobe rut this winter, try these ideas! 1. Layer. Wear your colourful pieces underneath, or on top. Black work blazer? Pair it with a colourful blouse which will peak out just enough to let the colours shine through. Same goes for coloured tights. I often pair turtlenecks with seasonal pieces to switch up the look and make it cold weather friendly. Pair a black turtleneck with a more seasonal dress, or favourite blouse. Alternatively, you can sport a bright turtleneck underneath of another top or sweater. I love how the neck pops out just enough to get a peek! 2. Accessorize. So your parka is black and that can't be swapped as easily as you'd like. But what about your accessories? Gloves, hats, mitts, bags... they are so many colourful options! Don't be afraid to accessorize with some colour instead of the go-to black and grey. I realize I type this and I'm wearing grey earmuffs and a black scarf in these pictures (lol), but that's because I'm pairing it with a pink sweater! I think the mix of tones compliments one another during winter. Faux fur is another great option. Try something as bold as a coloured neck piece, or as small as a bag key chain. 3. Colour Block. So you have a few bright or pattern pieces? Wear them all together and call it a day. Different colour combinations are so fun to break into to. Just try it out! Pair with some classic booties and you're ready for the weather. How will you switch up your wardrobe this winter?